The Water Warriors Zzapper is the second smallest of the Water Warriors line. Its size lies in-between that of the Water Warriors Firefly and the Water Warriors Hornet. 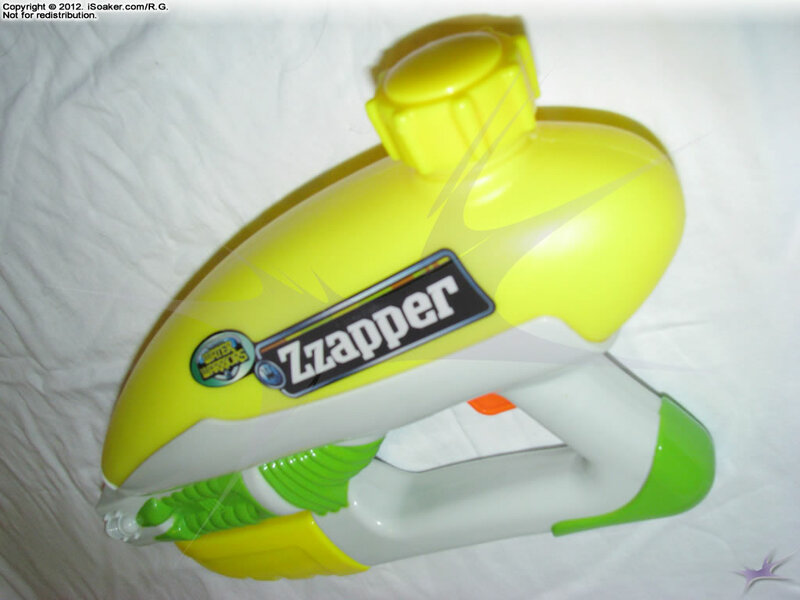 As with its brethren, the Water Warriors Zzapper has similar styling to the smaller Max-D Super Soakers, but unlike thsee, the Water Warriors Zzapper has a guided pump and sliding, mechanical pressure gauge.. 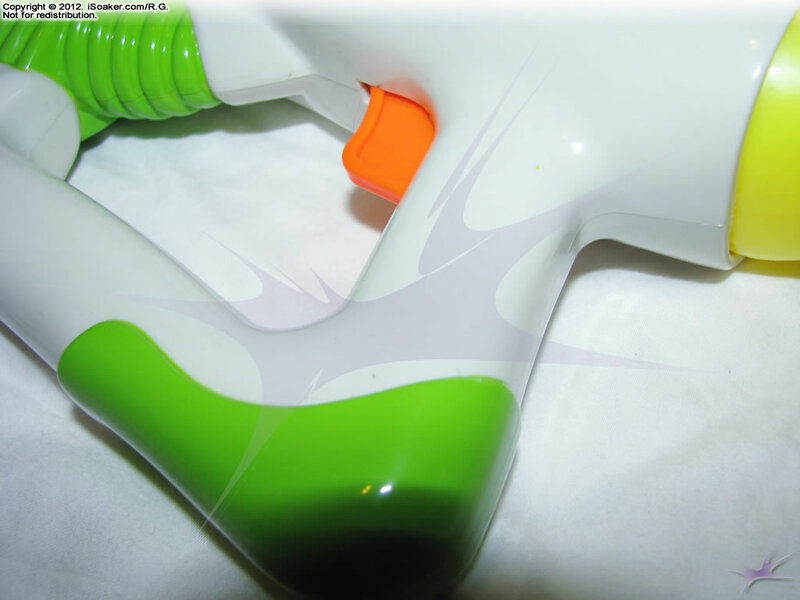 The Water Warriors Zzapper features a single nozzle powered by its pressurized reservoir. Being a pressurized water blaster, streams produced can have both power and be continuous. 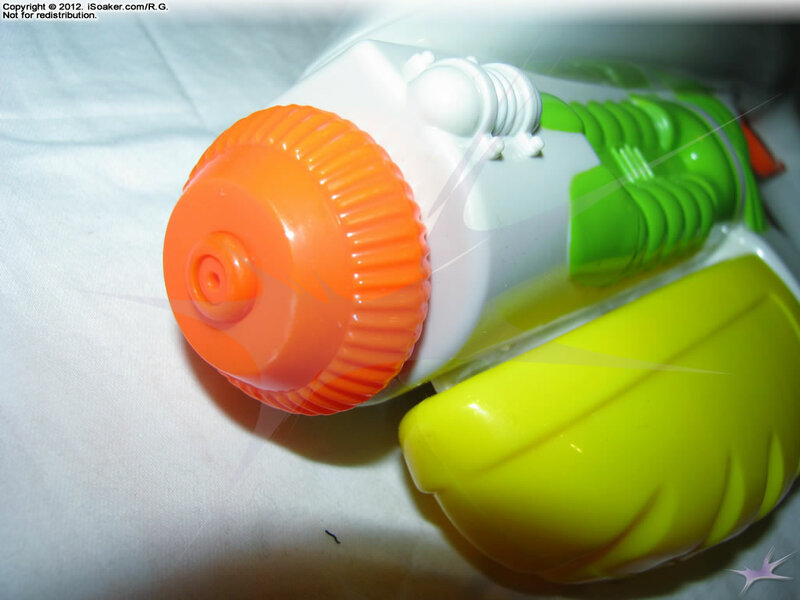 As the Water Warriors Zzapper is a smaller water blaster, stream output is good, though less that what larger air-pressure-based water blasters are capable of producing. 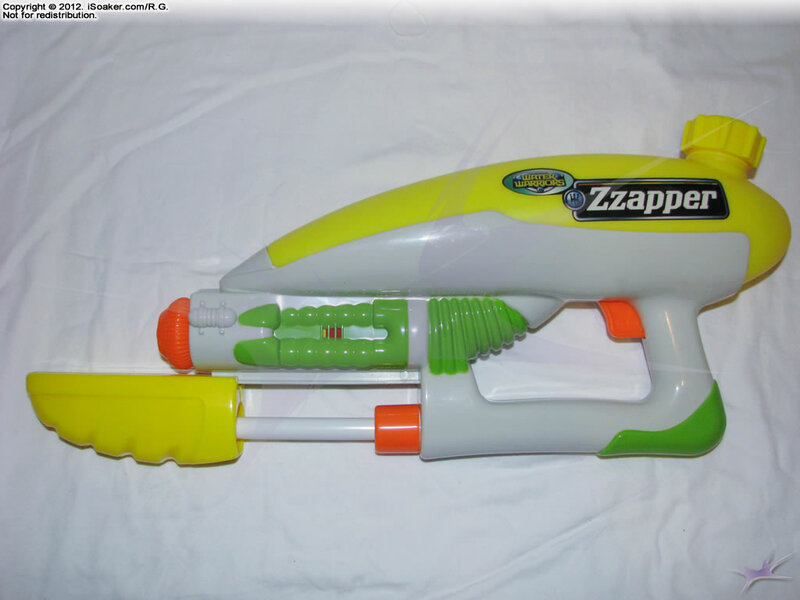 Being a pressurized reservoir blaster, the Water Warriors Zzapper's pump is designed to push air into the reservoir. The pump, itself, is tracked, positioned along the bottom of the forward section of the blaster. The pump stroke length is on the shorter side, but pumping is smooth and the pump can pressurize this blaster quite effectively. A decent number of pumps (on the order of 30-40 pumps) to properly pressurize the reservoir. 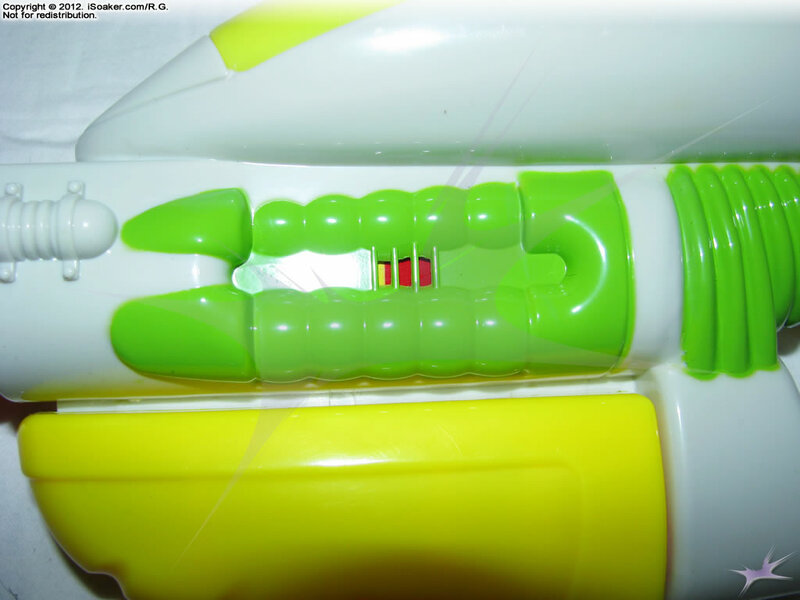 The trigger and grip area of the Water Warriors Zzapper is limited due to the styling and design of this blaster. As the pump housing actually runs along the full length of the base of the blaster, this makes for a rather cramped trigger/grip area that is not as easy to hold, particularly due to the thickness of the bottom area where the pump is. Most hands will likely not completely fit comfortably. On the bright side, the blaster, itself, is not heavy, making it usable. However, this cramped styling is probably the Water Warriors Zzapper's greatest fault. The reservoir on the Water Warriors Zzapper holds a decent amount of water in its reservoir for a blaster of this size. Being a pressurized reservoir system,the entire reservoir should not be filled in order to leave enough volume for adequate pressurization. Accessing the reservoir is through a tethered cap that is anchored via a string and an internal piece of plastic; this also means that the anchor can rattle around inside the reservoir. Thanks to the respectable volume provided by the reservoir, shot times are generally good assuming the blaster is pressurized properly. As a whole, the Water Warriors Zzapper is a decent, lower-class water blaster. It is probably best suited for being a primary only in small skirmishes, but being a decent choice for a back-up in larger, longer battles. Of course, one must be wary when going up against significantly larger pressurized blasters. Nice size, light, easy to carry. Packs respectable power for its size. Has a pressure gauge. Easy to fill with a nice, tethered cap. This is a rather small blaster compared to the others out there. The trigger and grip area and grip is a cramped, meaning that larger hands will not be able to have all fingers on the grip comfortably. Solid-coloured reservoir makes it more difficult to determine how much water remains. Pump stroke volume feels a little on the low side.